This is a summary of a CBS Wire article, published on 9 October 2018. Click here to read article in full. Nattana Utoomprurkporn, a current Copenhagen MBA student, is only 26 years old and knows that she is to take over her family’s Bangkok-based business, which imports hearing aids from Europe. But she is not quite ready yet. “I didn’t want to take over the business right away. I felt like I needed more experience work-wise, but also in terms of education, and CBS seemed like a perfect fit,” she says to CBS Wire. 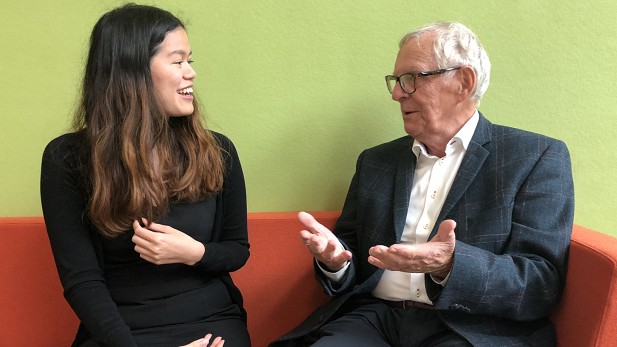 Nattana was the lucky recipient of the Waldemar Schmidt scholarship, founded by the former CEO himself to promote international experience and exposure to Danish leadership. “It is so important to live abroad, especially at a young age, because you get a whole new perspective on your home country. And staying abroad is something you will never forget, so I thought this was a good way to help,” says Waldemar Schmidt, who has previously lived in Brazil for 10 years.